You’ve spent precious work hours writing this week’s company blog. Or maybe you’ve spent precious budget dollars to hire an employee or contractor to write it. Either way, writing a blog is an expense. You want a return on your investment. 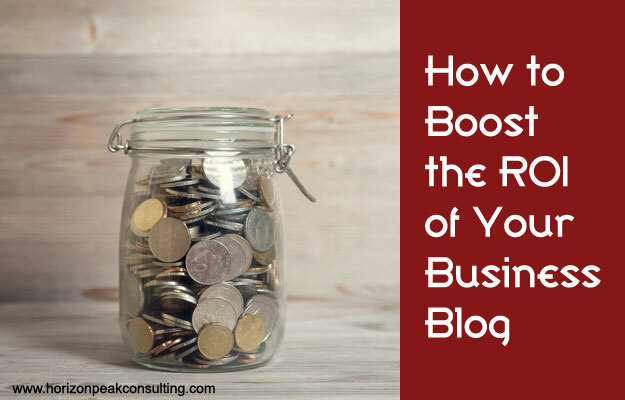 The good news is, it’s not that hard to significantly boost the ROI of your company’s blog. Here are three quick, effective and easy-to-do tactics for increasing your business blog ROI. No matter how great your Google search rankings are, you can’t count on your audience to just find your blog posts. You need to put them out there. Social media is a very effective way of reaching a broader audience with your blog posts. Not every social media platform is the same, however. Spend the time to research and understand where your target audience is spending time. In general, LinkedIn and Twitter are the best platforms for B2B companies. In fact, according to a 2015 B2B content marketing survey from Content Marketing Institute, 94% of B2B marketers use LinkedIn to distribute content, making it the most-used social media platform for B2B marketing. Respect the platform. Each social media platform is unique. Learn how to use them right so your content appears native – not foreign or salesy. For example, learn how to use hashtags to your benefit on Twitter, how to write an effective introduction to posts on LinkedIn or how to use images effectively on Facebook. Post other people’s content too. If your blog posts are the only content in your feed – on ANY platform – it will just look like a billboard for your company. To make your social media feed useful, insightful or entertaining (which will attract more followers), make sure you post things other than your own content. Share articles that your audience would enjoy, post behind-the-scenes photos of your company at work, or share other companies’ blogs. Whatever you do, don’t make your social media feed all about you. It should be all about your target audience. If you’re already sending out an email newsletter or marketing emails, congratulations. You are part of the 83% of B2B content marketers who have realized the value of this tactic. But are you using your blog content in your newsletters? Including your blog content (or at least a link to your blog) in your email newsletter or marketing emails is a great way to get more bang for your blog buck. It helps your blog reach a wider audience and improves the overall value of the emails you are sending out. Numbers 2 and 3 will also help drive traffic to your website. SlideShare is quickly climbing the ranks of valuable content-sharing platforms. It allows you to upload presentations (PowerPoint, PDF, Keynote or OpenDocument formats) and share them as slide decks on the site itself, or embed them elsewhere. Repurpose your blog content by creating a slide deck from it. Then upload it to SlideShare. Doing this makes it easy for other people to share your content as interactive slide decks. It also makes it easy to repurpose your content yet again by posting it as a slide deck via social media, newsletters, future blog posts, etc. Here is a great article from Social Media Examiner with even more ways to use SlideShare for your business. Writing and publishing your blog should not be the end of your content marketing effort if you want to see a return on your investment. Stretch your blog content farther with social media, email marketing and SlideShare to boost the value and increase your ROI.